Rosenbaum, IT Works, and Uday's Magic World proudly bring you Rocket Wax. This all natural, hard magician's wax is collected from the wild Rock Bees in the remote Western Ghats Mountains of India, bringing together the name Rock-Ghats-Wax or Rocket Wax. 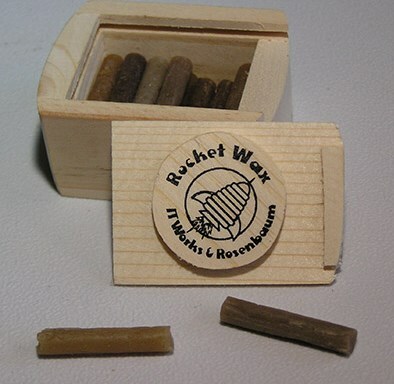 Rocket Wax is a pure, all natural, sweet smelling bee's wax that contains no paraffin or fillers. This hard magician's wax will leave virtually no sticky residues as with other translucent waxes currently on the market. Rocket Wax is perfectly suited for your Street Magic IT effects and will easily and cleanly detached from items. Rocket Wax is also highly resistant to "pulling through" your IT and especially when using small amounts of this quality wax. Rocket Wax is formed into small round bars which makes it perfect solution for pinching off just the right amount of wax for your effects. This is the ultimate Magic wax and especially excellent for warmer climates! Contains approximately 6 grams of high quality wax.